Find out how to prepare herb gardens to survive till spring in cold-winter climates. 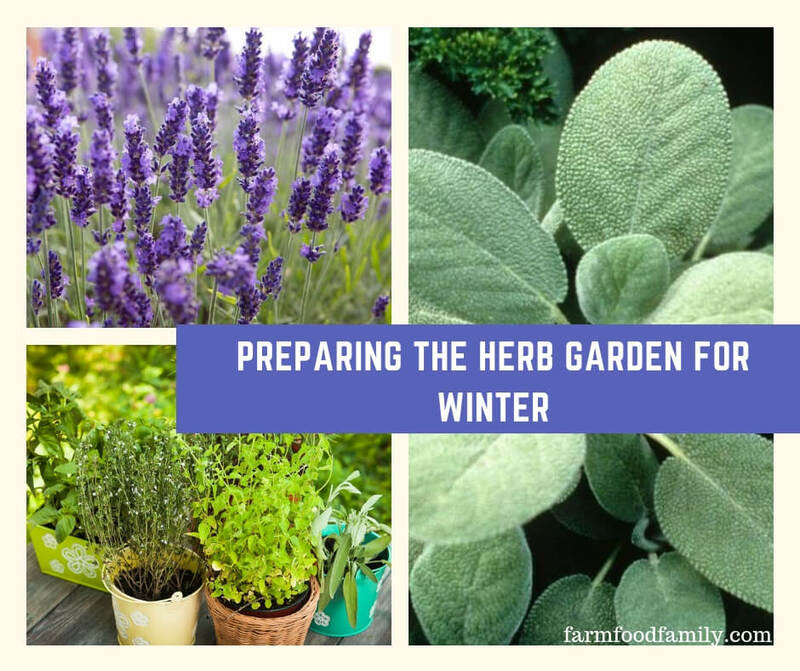 With a little planning and a little work, gardeners can significantly improve the health, survival, and quality of their herb gardens through wintertime. Many perennial herbs will be more likely to survive the winter if the gardener stops harvesting them a minimum of one month before the average first frost date. This is most important for herbs that sprout from existing stems, such as lavender and sage, or are evergreen/semi-evergreen (keep their leaves through part or all of winter), such as thyme. Pruning herbs is just like pruning trees – the act of pruning signals the plant to put out new growth, and this tender young growth is much more likely to be damaged or killed by the cold than the hardy existing growth. If you must harvest later in autumn, it is better to pluck individual leaves than to snip off an entire sprig. One way to simplify preparations for winter in the herb garden is to let annuals and biennials self-seed, and to sow seed of herbs that prefer cool weather in autumn or early winter. Many herbs, such as parsley, dill, cilantro, fennel, and chervil, can be left to self-seed. Any herb seed that is called a “hardy annual” (usually termed “HA” on seed packets) can be sown as it gets cold instead of waiting for spring. Be sure to cover winter-sown seeds with a little soil if possible (books and seed packets will advise how much for each seed) to make them harder for hungry birds to find. If gardeners are growing plants that sprout from existing stems, are evergreen/semi-evergreen, or are “marginal” (plants that are less likely to survive their winters than most plants), they can improve the plant’s chances by protecting the plant. One way to do this is to provide the plant with a strategic position. Many gardeners find that the best spot to grow plants of questionable hardiness or plants that tend not to do as well in their climate’s winters is by growing them by a south-facing wall or other especially warm microclimate. The heat generated by the wall or similar spot will help the plant to grow more robustly in summertime and to better survive a cold winter. This is especially likely to help plants that tend to be damaged in cold-winter areas, such as lavender and culinary sage. Another way that gardeners can help ensure the survival of these types of plants is to provide them with wintertime protection. One good way to do this is by protecting the plant with boughs from an evergreen tree. Another good way is to mulch the ground around the plant with high-grade sand, gravel, straw, or similar. One should be sure not to place the boughs or mulch around the plant until the ground freezes. Some sources recommend mulching with bark, but heavy mulch can weigh too much on the roots of herbs and leave them susceptible to root rot when the soil thaws. Many plants will live for months or years in their native habitats, but will not survive outside in cold-winter climates. These include lemongrass, bay leaf tree, basil, rosemary, Greek oregano, pineapple sage, lemon verbena, and some more tender cultivars of other herbs, such as some cultivars of sweet violet, lavender, and culinary sage. Most herbs do best indoors in a cool, sunny spot away from drafts and forced-air heating vents. Most people are more likely to overwater indoor plants than to underwater them, so unless the gardener is overwintering an herb that prefers consistently moist soil, they should be sure to stick their finger an inch into the soil to check whether it is dry at that depth before watering.